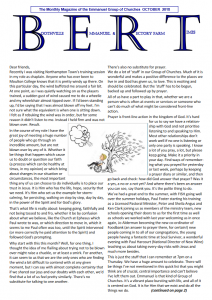 The church magazine BERT informs about what has happened in the different congregations over the last month. Different people will tell about their experiences. It´s usually opened by Haydon´s editorial and will also inform what´s going on in the next couple of weeks. The printed copy will always be available in the coffee shop or the office. But if you´d like to, have look on our online edition.